This popular waltz was written in 1891 by songwriter Charles K. Harris. In the song, an older man tells his niece why he has never married. He saw his sweetheart kissing another man at a ball, and he refused to listen to her explanation. Many years later, after the woman had died, he discovered that the man was her brother. “After the Ball” became the most successful song of its era, which at that time was gauged by the sales of sheet music. 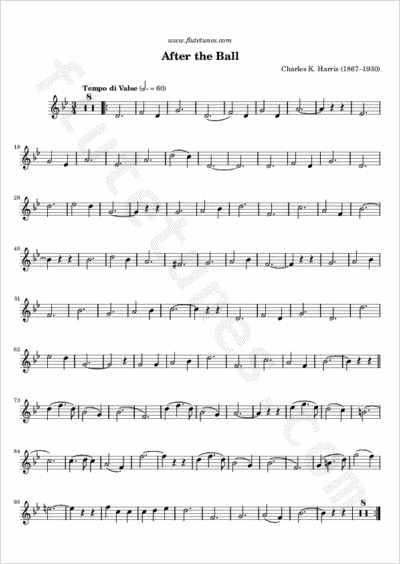 In 1892 it sold over two million copies of sheet music, and its total sheet music sales exceed five million copies, making it the best seller in Tin Pan Alley's history. Thanks to Michael from Ireland for suggesting this piece!